Bikram yoga is popular, and for a good reason. This intense and sweaty class will leave you feeling tired and sore, but also feeling cleansed and like you got a great workout in. It’s incredibly beneficial for improving strength and flexibility and it allows you to detox in a healthy way by sweating out toxins. Bikram is a great yoga class to try if you’ve never been before, but there are a few things you should know before your first time. Bikram yoga is a 90-minute class in a room set at 105 degrees Fahrenheit and 40 percent humidity. Every Bikram yoga teacher follows the exact same series of 26 poses and 2 breathing exercises so every class is the same. Expect the room to be very hot and be prepared to sweat buckets, but you’ll also have a great time! There’s no need to feel intimidated, just come prepared for a tough and rewarding workout. You can expect to feel either very tired or have tons of energy after a Bikram class. Either way, it’s a good sign. You should also expect to feel sore for a few days after, but don’t allow yourself to quit after just one class. If you keep going, you’ll see huge improvements from class to class and start to enjoy the challenging workout. Hydrate, Hydrate, Hydrate! – You know you’ll be doing a lot of sweating during Bikram yoga so it’s essential that you replenish your body with water. Make sure to drink plenty of water before and after, and bring a full bottle of water into class with you. It’s mandatory to have water by your side in a Bikram class and the teacher will give designated drink breaks to make sure you stay hydrated. Less is More – In a sweltering room filled with other sweaty bodies, less really is more. Don’t wear anything warm, long-sleeved, or not easily washable. It’s safe to go in as a little as a sports bra and short spandex shorts if you feel comfortable with it. You won’t look out a place in a Bikram classroom if you are wearing little clothing to allow your body to breathe through the sweaty and intense workout. Yoga Towel – Bring a yoga towel rather than a yoga mat with you to a Bikram class. A towel won’t get slippery when wet and it’s easy to wash afterwards. You should also bring a small hand towel with you for wiping off sweat during and after class. Bring a Toiletry Bag – You’re going to want a shower after Bikram class! If there is a shower facility in the studio come prepared with a small toiletry bag for taking a shower. You won’t regret it. Remember to Breathe – Deep breathing is extremely important during Bikram yoga. It’s a very physically taxing form of yoga practice, so let your breath guide you through the intense workout. Remember to breathe deeply, and take short breaks if you find yourself short of breath. Listen to Your Body – It’s essential that you listen to your body during Bikram yoga, especially if it’s your first class. Be prepared to work hard but don’t push yourself beyond your limits or you’ll risk injuring yourself. If you’re new to Bikram, you won’t be used to working out in this kind of heat and it can leave you feeling dizzy or nauseous. It’s a normal feeling, but allow yourself to take a break for your own safety if you start to feel this way. You also might want to let the instructor know that it’s your first class so that they know to keep an eye on you and help guide you through the poses. Lastly, be kind to yourself! Bikram yoga isn’t an easy yoga practice so know your limits and have fun. Most of us spend our day sitting in front of office desks which often times leads to improper posture and stiffness of the body. Heart openers are yoga poses that expand the chest region and stretch up to the crown of the head. These poses promote better respiratory health and improve spine flexibility. They also effectively help on developing proper posture which plays a vital part in keeping your overall well-being at its best. From countering back pain to boosting your confidence, performing heart openers can lead to benefits beyond expectations. The following yoga poses do not only give your body the chance to revitalize itself but also pampers you with relaxation. Strike these heart openers and develop composure within oneself. Begin by lying on your stomach with your legs extended back together and the hands underneath your shoulders. As you breathe in, press away from the floor, sending you up and back. Feel the stretch from the heart region up to the top of your head and slowly lower down as you exhale. Repeat these mechanics for 3-5 times and deepen the stretch with every breath. Start accessing the pose by kneeling and making sure that your knees are hip-width apart. Then, place your hands at your waist as you inhale and lengthen your spine. Slowly breathe out while bending back as your palms reach for the sole of your feet. Feel the stretch on your shoulders and at the whole front of the body. While on this pose, you can either tuck your chin or allow your head to fall back freely. Hold the stretch for 3-5 breaths and slowly roll back up to release. Lie on your front and place your palms under your shoulders. Extend your legs together and gently push away from the ground. Check if your shoulders are activated by making sure they are away from your ears and keep your legs engaged by lifting your knees off the ground. Keep your gaze forward and feel the stretch on the whole front of the body down to your toes. Hold the posture for 3-5 breaths and lower down to the ground to release. Begin by lying on your back with the knees bent and the hands placed on your sides. Take a breath in, and as you exhale, slowly lift your buttocks off the ground, forming a 45-degree angle on your knees. After that, press away from the ground through your shoulders and feet, activating your core and gluteus. Always keep in mind to avoid putting any strain in your neck. Take 3-5 breaths in this position and lie back down to release. Being stuck in your daily routine can unconsciously affect your body in negative ways. Always remember to give yourself the time to ease out from everyday hassles and stresses. Strike these heart openers and breathe deeply into wellness. Most importantly, never forget to have fun flowing! So, chances are that if you look up the word yoga in whatever search engine you generally use and go to the “images” section you will most definitely run into various individuals captured while carrying out different postures and whilst being completely barefoot. Somehow yoga has been and, for most of us, is still associated with uncovered free flowing feet; and I mean it makes so much sense, being a practice that is strongly linked to concepts such as achieving unity, connection, detachment, and learning about simplicity. Recently though, we have seen the appearance of yoga shoes. NIKE has come up with their Studio Wrap 4, Adidas with their Crazy Move Studio Shoes, and a few other brands have also followed this new trend. But, do we seriously need shoes for our yoga practice? I believe that everyone is to make this decision on their own, but before you do here are a few things you may want to consider. Being barefoot while doing yoga makes a lot of sense when you see how your feet are literally the foundation of your practice. If you think about it all standing, or balance yoga poses are built from your feet upwards: your stability, your balance, and your body’s alignment all begin and have their base at your feet. For example, take the Ardha Chandrasana or Half Moon Pose: both of your feet work together as one of them pushes you towards the pose while the other one receives the energy of your push while wiggling back and forth as it finds the perfect equilibrium to keep your entire body quietly in this posture. While your foot tries to find its balance, all of its nerves are trying to communicate your mind and body where is it that the perfect comfort can exactly be found; once your foot finds this comfortable equilibrium it becomes easier for your whole body and mind to relax into this position. The moment you add a shoe, which is basically an extra layer in between you and the surface, it immediately becomes an extra step that your foot and body have to figure out in order to be able to become pleasantly rooted into a position. Having your feet uncovered aids you to feel grounded and connected to the earth, it allows you to soak up the Earth’s energy; you can also feel and see your feet better as you move from pose to pose, which soothes the flow and progression of your movements and, most importantly, you bring awareness to the “active roots” of your body. 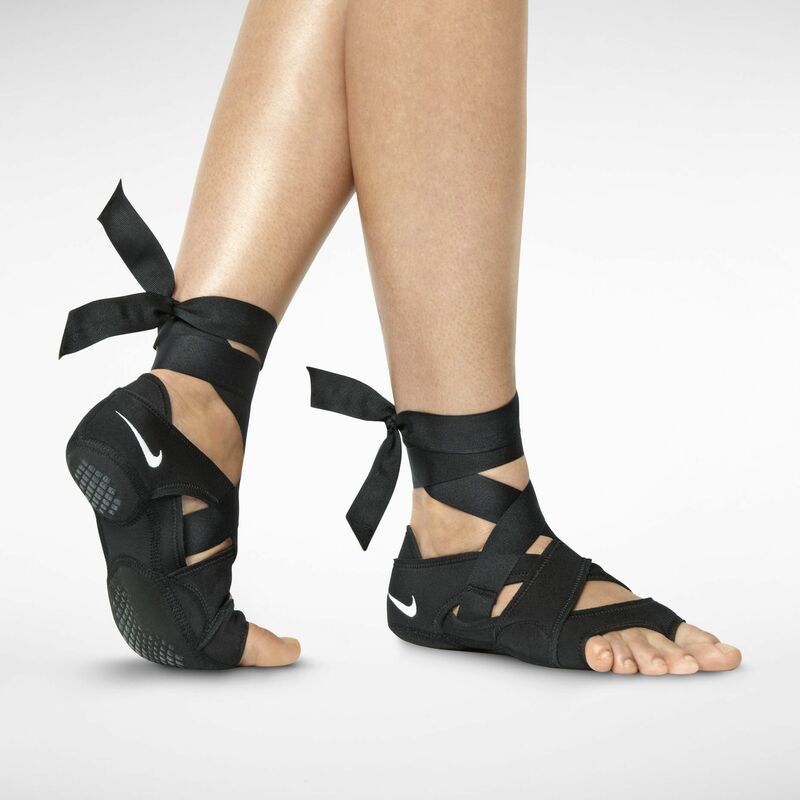 Although these shoes were made mainly to solve the problems of hygiene and slippage during the modern yogis’ practice, there are other alternatives to dealing with these problems: such as attending a studio that takes cleanliness seriously (disinfecting the floor after every imparted yoga lesson) or simply buying a mat with a roughed-up surface made out of proper materials. Unlike most of the other forms of yoga now widely offered in the West, restorative yoga focuses more on relaxation and healing. While it is considered a style in its own right, it can also be considered an umbrella term for other styles that focus on healing. People who attend restorative yoga do so to achieve emotional, mental, and physical relaxation. To be able to do this, one is required to use props so that he or she can hold poses for a little longer. The props also make it possible to maintain balance while doing the poses. This type of yoga can be directly targeted on the entire body or only on specific areas. Restorative yoga is a style that developed from the teachings of B.K.S. Iyengar. He was the man who helped develop Iyengar yoga and is widely respected in the field of yoga. Since Iyengar is the basis of healing yoga, it became the basis of restorative yoga. However, it was Judith Lasater, Iyengar’s students who developed restorative yoga as an independent style and made it popular. The child’s pose – This is done by placing a pillow under the body and then tucking the heels under the hips; just like a child would do while sleeping. Legs against the wall – Here, one can place a bolster either under the back, hips, or legs while their feet are placed leaning against the wall. Reclining bound angle – Here, the props are placed under the legs, head, and arms. Savasana – This is a simple relaxation pose. One is required to place a pillow under their head and a bolster under their legs or feet. 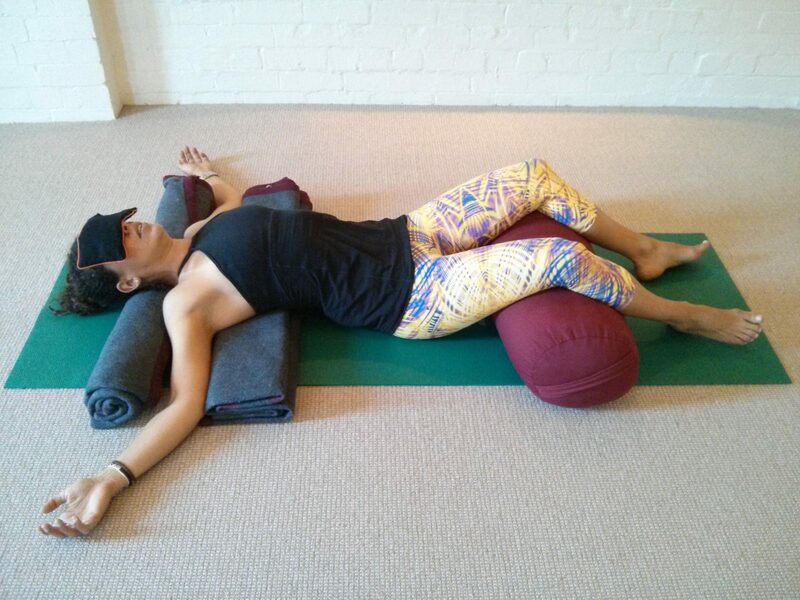 As mentioned earlier, props are a key part of restorative yoga. They are the aid that one uses to give support to the body while stretching or relaxing. The other items one may require include blocks, straps, pillows, chairs, blankets, and bolsters. To ensure that the relaxation is effective, one should ensure that the props obtained are the right size for specific poses. Getting a prop that is either larger or smaller can lead to either discomfort or injury. This can also affect the level of concentration one has during yoga. Due to the nature of poses involved in restorative yoga, there are chances that one may feel shapeless or motionless. This may not be emotionally healthy and putting on an eye pillow or placing the feet on the wall can help. A combination of various poses can be employed depending on the type or restorative healing one is looking for. Prenatal yoga has become extremely popular, and with good reason. When added with walking, yoga can be an excellent way for moms-to-be to stay in shape during pregnancy. Keeping off the excess weight is just one small benefit of prenatal yoga. It also keeps the body limber, muscles tone, and improves both balance and circulation. These benefits are all achieved with little impact on the joints, which is an added bonus to the already aching body. Breathing is a crucial aspect of prenatal yoga. It not only allows for deeper and more beneficial stretches but also helps moms-to-be practice deep and releasing breathes that will be extremely helpful during labor. Learning to breathe is one of the first things learned in prenatal yoga because of how beneficial it is in the present moment of stretching out the growing body and how crucial it will be during labor in the future. This breathing technique is known as ujjayi. To use ujjayi breathing, you take in the air very slowly through the nose to fill up the lungs and expand the belly, then you exhale through the nose until the lungs are completely void of air. This can be done during the exhale through the mouth during particularly painful or difficult moments to fully release the body. The bodies reaction to pain is normally to tense up, which can do more harm than good during both yoga and labor. By staying calm and taking deep, releasing breathes the body can relax further and lessen pain instead of intensifying it. Pain should always be acknowledged but should not be given into. Instead, pain should be breathed through and embraced. Prenatal yoga during the first trimester is very different from prenatal yoga during the third trimester. However, ujjayi breathing remains consistent during all three trimesters. The belly is still fairly small during the first trimester which allows for a variety of poses and mild twists. First-trimester yoga focuses on keeping up endurance and stretching the body. Second-trimester yoga incorporates a little more stressful. With the appearance of a small belly, some poses and twists are temporarily discarded from practice. The second trimester poses focus on stretching the side body and gaining leg muscle to help carry around the extra pounds that are to come. 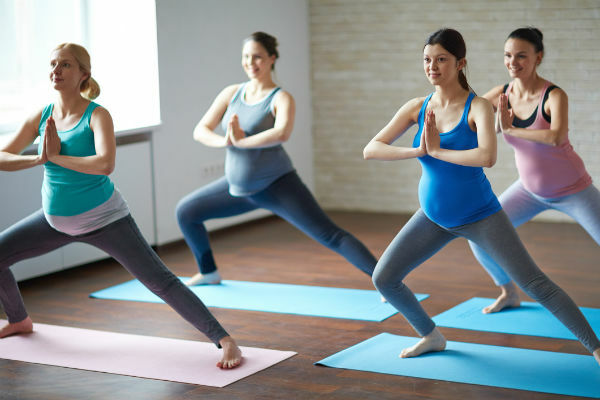 Most women feel very energized during the second trimester which makes it the perfect time to amp up yoga practices and get those legs strong to carry around the several pounds there are still to gain. The third trimester is often called the “home stretch” of pregnancy. Which is a very accurate name when it comes to yoga because this is the trimester that stretching consumes yoga practice. The body has grown substantially over the past several months and some key areas such as the lower back and hips are taking a lot of pressure from that extra weight. Stretching the hips and back can help ease the pain caused by the extra weight and the almost full term sized baby. It also can allow for a smoother delivery. Prenatal yoga is crucial in combating the aches and pains of pregnancy. Even if yoga was not done before pregnancy, it should at least be incorporated every few days into the daily routine to stretch out the body. Growing a human is hard on the mind and body which makes yoga a wonderful addition to prenatal care. are made from fabrics that includes lycra (spandex), nylon, cotton or polyester and can also add a mix of wool, silk and other fabrics. In the early 1990’s they were in competition with jeans and died down until just lately %u2013 they’re worn like yoga trousers. Now, are also referred to as yoga leggings and hold no real definition. They’re much like an alternate for yoga trousers holding quite similar characteristics such as design, styles, comfort as well as shade. They’re worn with baby doll tops, under mini skirts, with oversized jumpers as well as in a number of other ways. Are used for several purposes and therefore are sometimes worn during sports and other physical actions. Under sporting uniforms for running, jogging, Pilates, yoga sessions, and they’re mostly employed. In sports, like football with shin guards and football socks and even under cheerleading uniforms. Since their comeback there’s been an uncertainty regarding how in case you wear leggings? Are slacks or? If you does that just apply when you’re not wearing black leggings or cover your bottom? Can you also wear pumps with them as if you’ll with yoga trousers? How about colours as well as layouts? Jennings are a legging which is comparable to jeans (stretch Demin) which you can use as an alternative for normal jeans. Should you be needing to add some style to your appearance, you are able to go to get some of mixed-pattern design of leggings. Wearing black legging with a long jacket plus some heels is one of the very modern fads. Can be combined and matched with just about anything and is broadly accepted and used by many from individuals as if you and me to models on the runaway. What’s caused confusion is layouts, the colours and materials which can be coming about is because of the tendency of yoga trousers. Whether a great or bad thing, now anything goes. If you are looking for affordable comfort style as well as flexibility good quality wear for $20 or less, check 90 Degree by Reflex out.